Sat Nam Fest Malibu Canyon offers a wide range of housing options, from spacious private comfort to shared dormitories to camping beneath the magical canyon skies. Housing is sold as a flat rate, per-person for the festival. We have many housing options at a range of prices to meet any budget. Event passes and meals sold separately. Housing is for festival attendees only. You must have an event pass to attend the festival. Private accommodations sell out quickly! Book early to get your first choice! 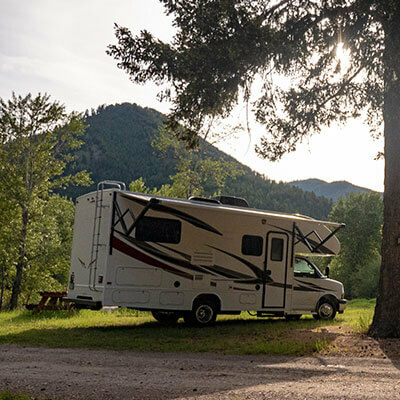 Bring your own tent and camp out amongst the beautiful canyon oaks. Showers and bathrooms are available in the campground. 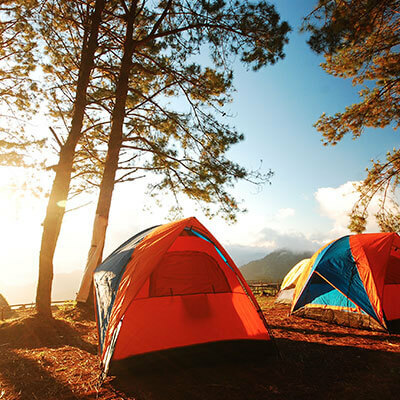 Camping is charged per-adult, not per-tent. Bring your RV! WE NO LONGER HAVE SPOTS WITH ELECTRICAL HOOKUPS, but we will provide you a space to park. Let us provide a tent for you! Arrive on site and your tent will be ready and waiting for you, including a cot, side table, lantern and sleeping bag. 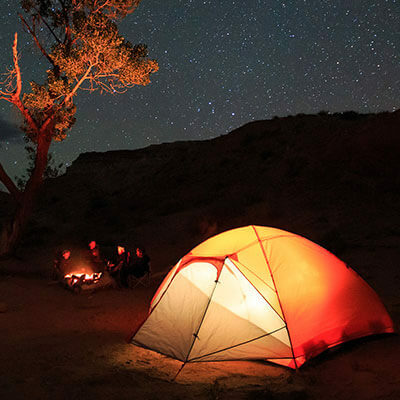 Sleep out beneath the stars of the vast desert skies. Showers and bathrooms are located in the camp ground. Rent a tents are sold per-person as private tents. If you would like to share a tent with someone please email us. This is our most affordable housing option. These are very simple A-frame buildings with cement floors. 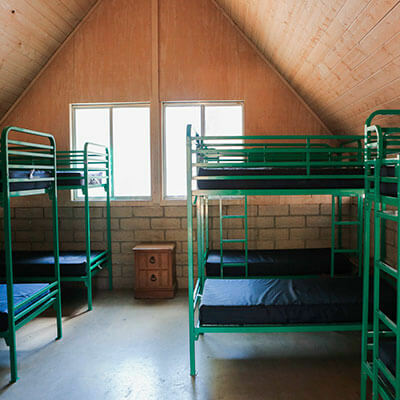 Each A-Frame cabin has 5 bunk beds. There is a separate bathroom and shower building in close walking distance to the cabins. Bedding can be rented for $20 and can be picked up on arrival. Housing is sold at a flat rate per person for the entire festival. 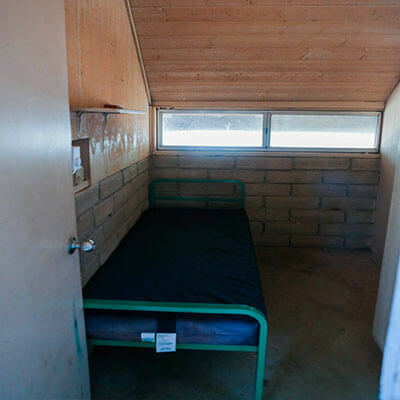 In each of the simple A-frame cabins there is one private room. It is quite small, but offers affordable privacy. There is a separate bathroom and shower building in close walking distance to the cabins. Bedding can be rented for $20 and can be picked up on arrival. Housing is sold at a flat rate per person for the entire festival. 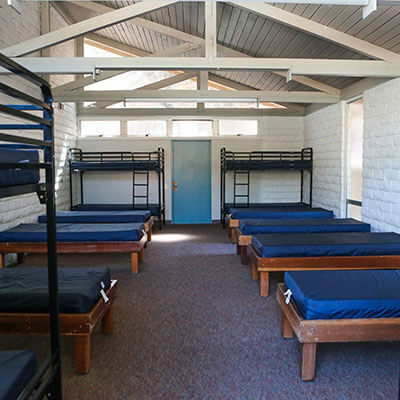 The dorm buildings house 12 people in twin beds or bunk beds per room. The dorm has bathrooms and showers inside the building. Bedding can be rented for $20 and can be picked up on arrival. Housing is sold at a flat rate per person for the entire festival. These rooms have either 2 bunk beds or twin beds. 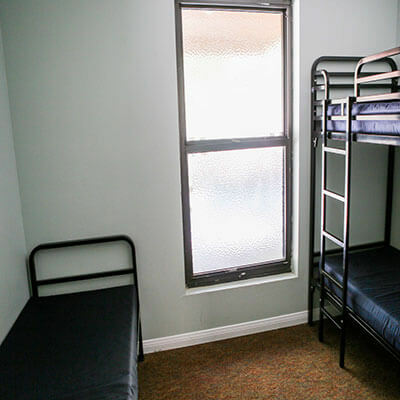 The are offered as double rooms for two people and are our most affordable double housing rooms. There are shared bathrooms for the building shared between 7 rooms. Bedding can be rented for $20 and can be picked up on arrival. Housing is sold at a flat rate per person for the entire festival. These rooms have bunk bed or twin bed but will be private to you. 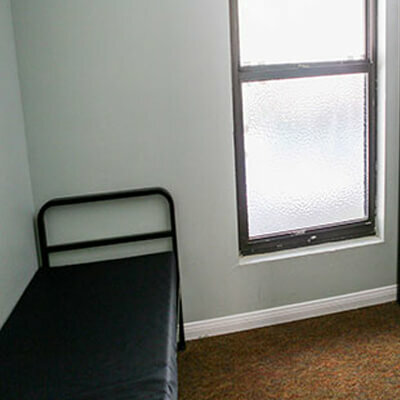 The are offered as private rooms for one person and are our most affordable private housing rooms. There are shared bathrooms for the building shared between 7 rooms. Bedding can be rented for $20 and can be picked up on arrival. Housing is sold at a flat rate per person for the entire festival. These are in the property’s Inn-style rooms. Each triple has a queen bed and two twin beds. When purchasing your tickets, you can choose which size bed you choose to book. 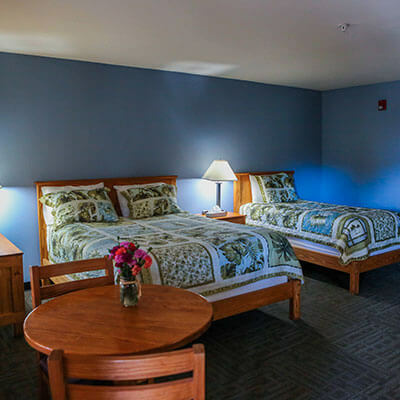 These rooms have private bathrooms, bedding is provided, they have a small table and chairs. Housing is sold at a flat rate per person for the entire festival. These are in the property’s Inn-style rooms. Each double has a queen bed and a twin bed. When purchasing your tickets, you can choose which size bed you choose to book. 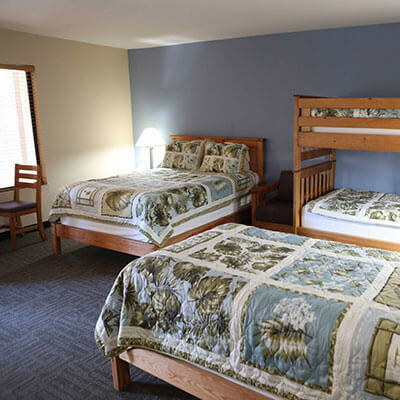 These rooms have private bathrooms, bedding is provided, they have a small table and chairs. Housing is sold at a flat rate per person for the entire festival. 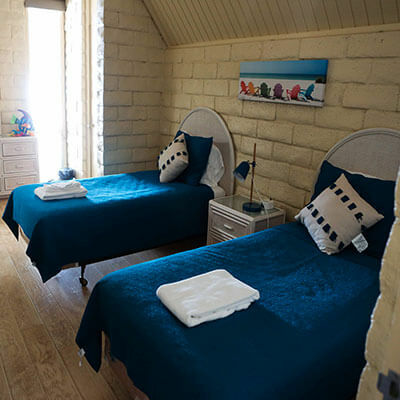 These rooms are in the AirBnb style lodges on the property. The lodges have shared kitchens and living rooms. The bathrooms are shared with one other bedroom. Bedding is provided. Housing is sold at a flat rate per person for the entire festival.